Let’s make something healthy, delicious, and a little salty today. It’s a delicious Korean side dish, meant to be eaten with rice and other side dishes. Have you ever heard of jangtteok (장떡)? They’re pancakes seasoned with Korean jang like ganjang (soy sauce), doenjang (soybean paste), or gochujang (hot pepper paste). They make great side dishes for rice and are a popular choice in Korean lunchboxes. I use kale in this recipe but you can use chopped Asian chives, perilla leaves, or green chili peppers. And my version is vegetarian, but you could also add some chopped seafood like shrimp, squid, or clams. It’s a very versatile Korean dish, and deliciously savory, earthy, hot, and crispy! If you make this jangtteok, or experiment on your own, be sure to send me a photo and let me know about it! I’d love to see your jangtteok! 5 large kale leaves, washed and drained. Create a batter by combining flour, doenjang, gochujang, and water in a bowl and mixing well until it’s soft, a little thick, and creamy. Remove the stalks and the center stalks of the kale by pulling off the leaves off with your hands. Roll up the kale leaves and chop them into small pieces. Add about 2 cups’ worth to the batter. Add onion and green chili pepper (plus red chili pepper if you use it). Mix well. Heat up a 10 or 12 inch non-stick pan over medium high heat. Add about 2 tablespoons vegetable oil and swirl to coat. When the pan is hot, spoon in half the batter. Spread it thinly into a to large circle with a wooden spoon. Cook for about 2 minutes until the bottom turns crispy. If it gets too hot, lower the heat to medium. Flip it over with a spatula, pressing down lightly to cook evenly. Cook for 2 to 3 minutes until the bottom gets crispy and golden brown. Flip it over one more time and let it cook for 1 or 2 minutes. Both sides of the pancakes should be crispy. Transfer it to a serving plate right away and serve, or transfer it to a cutting board and let it cool for 1 minute before cutting it up into bite size pieces. Put it into a plate and serve as a side dish for rice. You can make another large pancake with the second half of the batter mixture, or 3 small circle pancakes. Posted on Thursday, July 10th, 2014 at 1:39 pm. Last updated on April 26, 2015. Posted February 25th, 2018 at 11:25 pm | Log in to reply. I second BelaCooks’s question: How would you steam the pancakes? Use less oil and then put some water in and put a lid on top really quick, like pot-stickers? or on a plate in a traditional steamer? I love your videos! They help my family and I eat more vegetables. Posted August 18th, 2017 at 5:35 am | Log in to reply. Posted August 2nd, 2016 at 7:35 pm | Log in to reply. This recipe is delicious! I made it with Swiss chard and mustard greens because I had those and didn’t have kale. My family loved them too. Posted March 19th, 2016 at 10:02 am | Log in to reply. What can I use instead of kale? Posted March 19th, 2016 at 11:08 am | Log in to reply. Posted March 19th, 2016 at 11:33 am | Log in to reply. Posted November 20th, 2014 at 8:59 pm | Log in to reply. I just made a gluten free version of these with bobs mill all purpose flour plus 1/4 cup buckwheat flour. I often need more gluten free flours because it’s the gluten that expands and soaks up a lot of moisture in batters made with wheat flour. They were really delicious! I ate them with a bit of kimchi (made from your kimchi recipe) as relish and a bit of mayonnaise. The kimchi and mayo was perfect on them. Yum! Posted September 29th, 2014 at 11:10 am | Log in to reply. I absolutely love your videos, they always make my day! I would like to ask you a question. 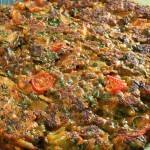 I love making haemul pajeon. And I have made it for my friends and family before. On Sunday’s I have drama class at church and they wanted me to make the haemul pajeon for them. Church starts at 10:30 and ends at 12 and then drama class is afterwards. (now here is my question) How would I keep the pajeon from getting soggy. I’ll be making it right before church. Any tips? Posted August 1st, 2014 at 8:57 pm | Log in to reply. I love this recipe, so easy! This is a great use for kale, which is normally bitter and hard to make delicious things out of. I’ve made this recipe more than a few times in the last week. Some modifications I made are using miso paste to flavor the batter because I didn’t have gochujang, and adding the last of my nappa kimchi (along with the juice for spice in place of the gochujang). Miso made it salty and extra yummy. Posted August 1st, 2014 at 8:09 pm | Log in to reply. Hi! I have been a big fan of yours for a couple of years–your videos and recipes make cooking Korean food so fun and easy! 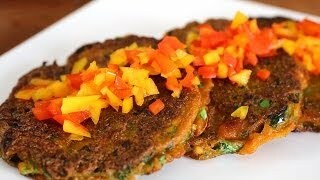 However, I just found out I’m sensitive to wheat (gluten)… I can tolerate a little flour, like on your yummy butternut squash pancakes, but I’m afraid the amount in this awesome recipe would be too much for me. Would you have a suggestion on a good substitute? Thanks so much! Posted July 17th, 2014 at 5:29 am | Log in to reply. This was sooo good! I made it with carrot leaves and endive, with green pepper and onion. It is a great way to cook the somewhat bitter healthy leavy greens. Thanks! Posted July 15th, 2014 at 3:23 pm | Log in to reply. Hello Maangchi! I made these jangtteok last night with kale fresh from my friend’s garden. They were delicious! I discovered your website a few weeks ago and have been making delicious korean food for my husband and I non-stop! (he is half korean). I have been making all kinds of ban chan, dak galbi, and have even made my own kimchi and grown my own kungnamul! (I just started a second batch this morning) I am having so much fun cooking delicious, healthy food for us :) Thank you so much for all your wonderful videos! Posted July 19th, 2014 at 9:53 am | Log in to reply. This recipe was originally posted on July 10, 2014 at 1:39 pm by Maangchi. It was last updated on April 26, 2015. The video was watched 191,476 times on YouTube & has 3,619 likes!